I have recently received two blogging awards. And while I didn't originally intend to post about them, I just couldn't resist posting Sassy's cuz she's been my follower for a long time and I figured I owed her. She's one of my original gals. Plus her post was funny. And then I felt bad about not doing the one Dani gave me a while back and thought that if I did Sassy's I had better do Dani's too cuz that just would NOT be fair. 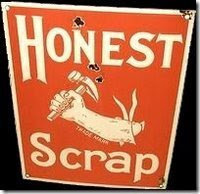 This one is the Honest Scrap Award. I am supposed to say 10 things about myself with full honesty. I don't care whether my house is perfectly clean. I would LOVE LOVE LOVE for it to be clean. And I put on a nice pretense of having a clean house when we have company but for the most part my house has stuff everywhere all the time and there are no signs of that getting better anytime soon. I tend to replay conversations over and over in my head and wonder if I said something inappropriate or if something I said was misconstrued to mean something I didn't intend for it to mean. I hate hate hate to fight and have learned to let things go because most of the time it just isn't that important or worth it. I yell at my kids. I'd love to be one of those moms that can talk calmly and quietly. But I get angry and I yell (not all the time). My kids are stubborn, self assured and think they know it all. But I also think it means they will grow up self assured, strong and independent. I love playing the devil's advocate. I like healthy discussions about all sides of an issue. I like to argue my point or side just because. I'm very independent which makes my hubby and mom irritated. I'd rather just do everything myself and prove to myself how strong I can be. That's how I built my kids fort! I have a hard time reading the bible. I have to be very disciplined to do it and I usually understand it better if it is written as historical fiction. Some of my greatest "aha" moments came from reading biblical accounts written with a fictional subtext. I love to watch movies about the 18th century and think it would be really cool to live in that period. That time period brought about Mozart, Bach, Vivaldi, Stradivari, Austen, etc... How cool is that! I am very good at saying the wrong things at the wrong times. I always want to be a better mom, wife, daughter, friend and Christian than I am. And I always seem to fail trying. I hope that didn't scare ya'all off. hee hee. I'm supposed to tag 7 bloggers for the Honest Scrap award and I'll link to you below. You don't have to do it. But it was kinda fun! (1) Thank the person who nominated you for this award. You don't have too. (2) Copy the logo and place it on your blog. (3) Link to the person who nominated you for this award. (4) Name 7 things about yourself that people might find interesting. (5) Nominate 7 Kreativ Bloggers. (6) Post links to the 7 blogs you nominate. (7) Leave a comment on each of the blogs, letting them know they have been nominated. Sassy gave me the Kreativ Blogger award. Thanks Sassy! (1) Thank the person who nominated you for this award. When Liam vomits his food while I am feeding him. I will catch it in the bowl and refeed it to him. I know it is reeeaaaaallllllly gross, but with all the additives in his food I'm not sure what to add in the next bowl if I have to start from scratch. Luckily he doesn't do it too often anymore. I love this webpage here. I want a tattoo. I have wanted one for a long time. Just something little and meaningful. After the death's of Kyle Ann and Brady I knew I would want something about them inked on me forever. But I still haven't gotten up the nerve. Or the money. I hate ear wax in my ears and due to years of over cleaning, I no longer produce any. I've been in the news. For positive and not so positive things. I only get 5-6 hours of sleep a night. A woman is pregnant for 280 days (average). Rylie was born 285 days after I got married. 1) Angi at Elizabeth Ann Lizzy and Liam have similar brain injuries & are micros. Thanks for the award and sweet comment Jennifer. We Mom's do some crazy things sometimes - yikes refeeding you know...is up there! A Mom's gotta do what a Mom's gotta do right? PS Please email me so I can get you in touch with Danielle to get your make-over! I don't know 7 bloggers...but thanks. Oh and by the way...I am not old!